Westcott has released the next generation of their popular Flex lights, including daylight, bicolor, and RGB versions in multiple sizes. The new Westcott Flex Cine lights are compact, durable, flexible LED mats that are more powerful and versatile than the original versions. Along with a brand new RGBW version, the new flex lights also come in kits, with new mounts and modifiers and storage options. 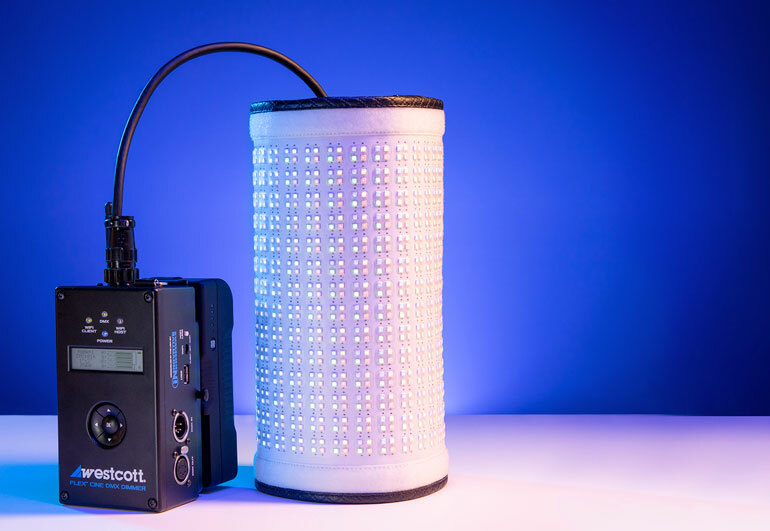 When they first came out a few years ago, Westcott’s Flex lights shook up the LED lighting industry for filmmakers and photographers. While offering as much output as traditional LED panels, the flex lights are extremely light and can be used in previously inconceivable ways. Alternatively, they can be rigged up with hard frames and placed in softboxes, much like regular LED panels, but differ wildly in how much more portable they are for packing and travel. Now, of course, there are many other companies producing their own similar lights, and there are even instructions on how to make your own DIY LED panel. Our failed attempt is a good lesson in the false economy of trying to go too cheap. Westcott’s Flex lights continue to be dependable light sources for filmmakers, while some of the Chinese flexible lights we’ve bought are already starting to wear out, after only a few trips. 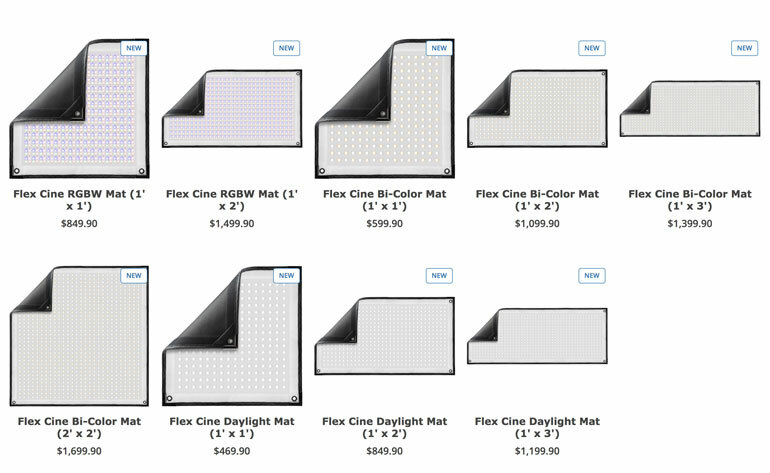 The new Flex Cine mats have been redesigned from the ground up. They are 1/3-inch thick, with a pliable structure that keeps its shape. That’s important to note because several other flexible light mats out there don’t actually keep their shape when they’re bent. The Flex Cine lights can be concealed in corners and tight spaces, mount to any traditional light stand, taped to a ceiling, you name it. They are also water-resistant, which means they can be used in light rain or near water. 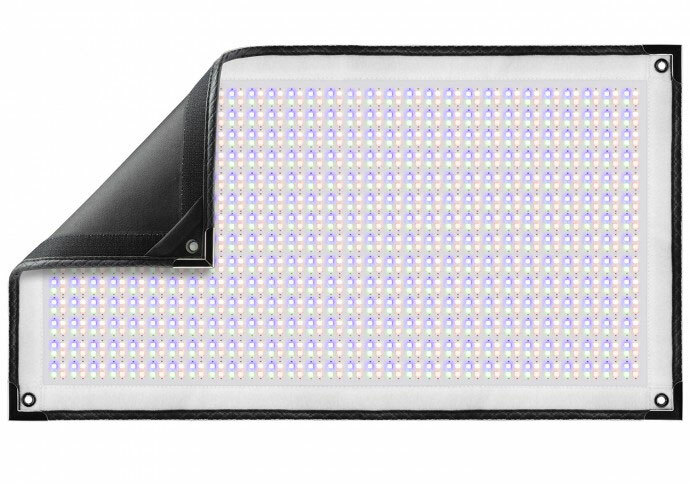 There are several ways to mount or hang a Flex Cine light, thanks to the metal grommets in the corners, magnetic corners on the back corners, and velcro borders on both sides of the mat. They can also be rolled into a cylinder and placed on a tabletop surface. In fact, the ability to be shaped this way means the output beam angle can change from 140 to 360 degrees. The Flex Cine lights come in a 1×1, 1×2, 1×3, and 2×2 sizes. 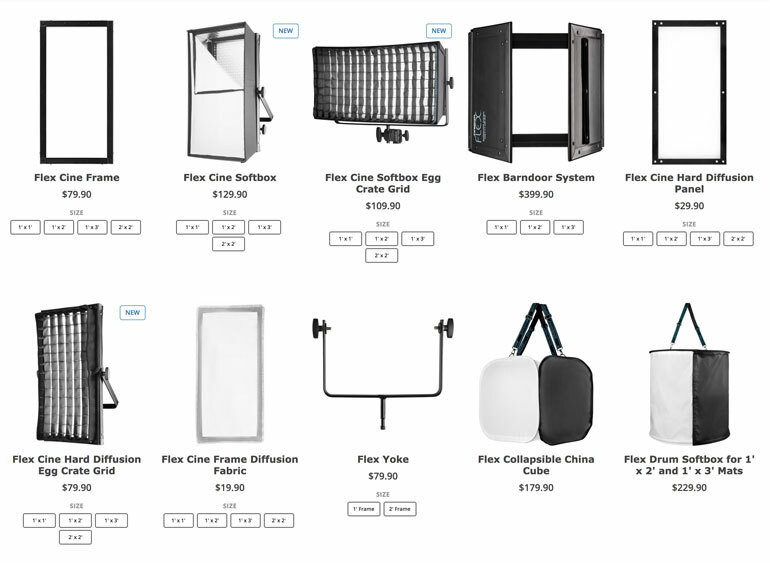 To shape the lights, Westcott has a wide variety of lighting modifiers for each size of the Flex Cine, including barndoors, hard diffusion panels, egg crates, diffusion fabric, a drum softbox, and a more traditional scrim frame and softbox system. There’s even a collapsible China Cube. 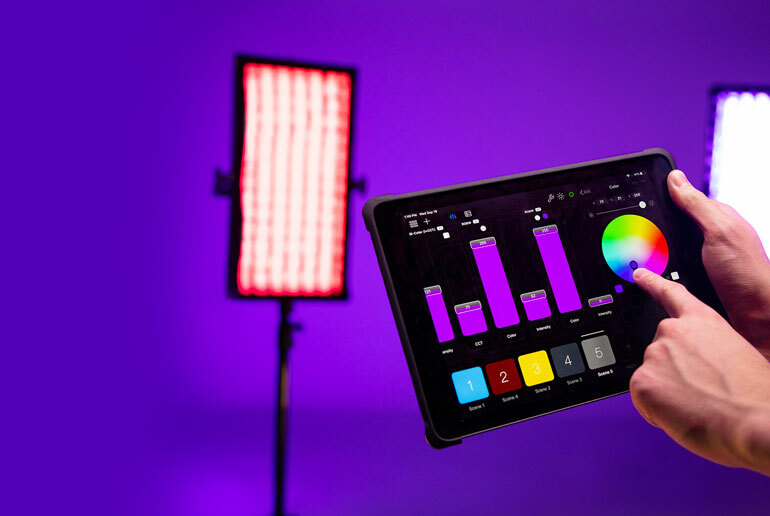 The new addition of an RGB light in the flexible mat format is sure to be a hit for many filmmakers who are quickly adopting RGB lights. Even if you don’t think you have a need for full spectrum color, giving yourself the option to match whatever lighting situation you walk into is a very attractive case for investing in RGB technology. At the moment, the Flex Cine RGBW mat is only available in 1×1 and 1×2 sizes. It has a color accuracy of 97 CRI and 98.7 TLCI, and an output of 1800 lux for the 1×1 and 3500 lux for the 1×2 – measured at one meter. The one caveat with all of these new Flex Cine lights is they require the new Wireless DMX dimmer unit, which isn’t particularly cheap. 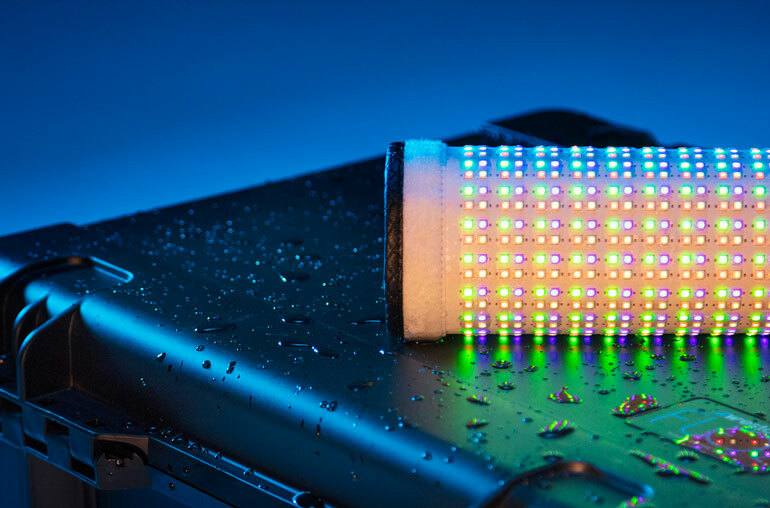 It does have some nice features, like automatically sensing how much power is needed for any Flex light you use (it’s backwards-compatible with previous Flex lights). Built into the dimmer is the ability to control color in the RGB mats, as well as loading up 120 pre-loaded color gel presets. The DMX dimmer can also be controlled wirelessly via an app. To power the dimmer and the mats, you also need a V-mount battery. A standard 14v battery can only be used to power the 1×1 daylight or bicolor mats. For the other sizes, you a need a 26V battery, plus a 26V battery charger. You also need a separate AC adapter if you want to get power from an outlet. That all adds up very quickly! We still wish there was a simpler way to power the smaller 1×1 mats with Sony NP batteries. That’s been one of our ongoing complaints about flexible mats in general – the lights themselves are incredibly thin and lightweight, but the power requirements are as bulky and heavy as any other LED panel, limiting the portability of flex lights in the first place. But then again, a 2×2 bicolor flexible mat is pretty dang compact for a light that can output 7400 lux at 1 meter – even with all the power accessories. It’s been on our wishlist for quite some time, and the new version looks to be an even better investment than the original. More info on the Flex Cine lights at the Westcott site or at B&H Photo Video.